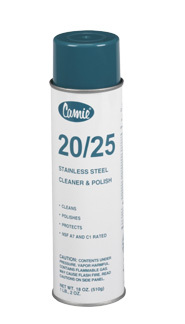 Easily cleans and polishes all metal surfaces, especially chrome and aluminum, and is safe for stainless steel. Mild odor. Leaves a protective film to resist dirt. Not recommended for plastic or painted surfaces. 20/25 can not be used on cooking, eating or food contact surfaces. Does not contain alcohol or other caustic cleaners. Packaging: Sold in 19.9 fl. oz. cans (18 oz. net weight); 12 cans/case (not available in bulk). Our spray cleaners/degreasers are comparable to the following brands: 3M, ATM, Blue Gold, BridgeView, C&H Chemical, Calfonex, Cartier, Chem-Pak, Cosco, CPC, CRC, Dickler, Ellsworth, Four Star Chemical, Hygela, IndusCo, Jax, Jolt, King Pine, KPA, Krudkutter, Krylon, LBS M.G. Chemicals, Mean Green, MPC, MRO, Mykal, Perma, Permatex, Phillips, PolySystems, Price-Driscoll, Punch, Rite-Chem, Rocol, Safety-Kleen, Sentral Chemical, Sierra, Solvent Kleene, Solvon, Spray Nine, Spray On, Stoner, Sun Brite, Tech Spray, Utility, Weicon, Zibb, Zep.